Amit Singhal, SVP of Google Search announced that Gmail is testing a new feature in which Gmail.com users who go to Google to do a search, may see their own received emails displayed on the search results page. How would this work? 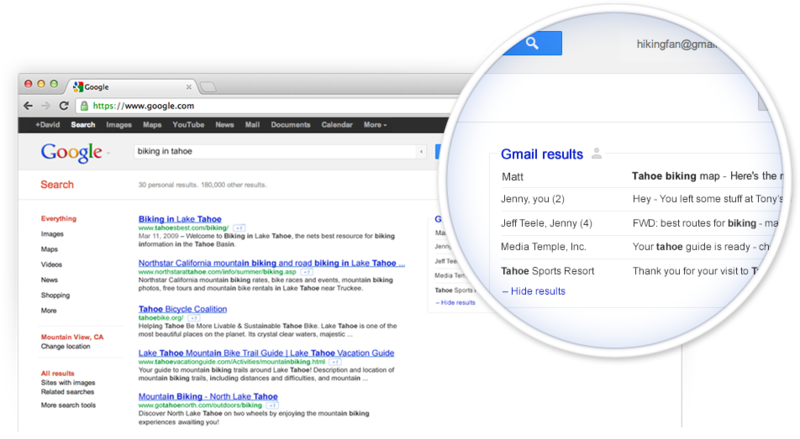 Well Google will simply take the search query, use it to query the web as usual, but then also query your gmail inbox. If a marketer sent you an opt-in email newsletter on the topic of “social media marketing tools”, and you then go to Google to search something similar to “social media marketing tools”, you’ll see on the right side of the Google search results page are displayed some search results from your own gmail inbox, including that email newsletter. For marketers, this could be really cool in that even if your gmail subscriber didn’t do much of anything with your email newsletter, your subscriber might see your newsletter show up on their own search results page. I can see how this could be useful to the user as well. In my own case, I often archive a lot of emails that I receive in gmail. For example, I might have archived an opt-in email from Groupon which had a discount to that hip, funky, new coffee house in the Virginia Highlands area of Atlanta. I may not be ready to use it now, but if two weeks from now I do a Google search for just such a place, I might see that Groupon email pop up in my search results. Reopening the opt-in email newsletter may also boost your email sending reputation by the simple fact that the recipient is engaging with it again. Engagement is a critical factor in your ability to get email marketing messages into the inbox. More information can be found on Google’s blog. If you’d like to try it out, Google is allowing some gmail users to opt-in to the trial period of this feature.